She is a truly outstanding young cow. 73"TTT on her fourth birthday. Great pedigree, one of the new industry's best. Look at total horn, will go over 100" with ease. 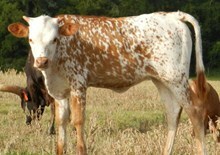 Very colorful spots that she passes on to her calves. Calves like clockwork. 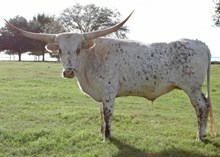 Six longhorns with over 80" TTT in her pedigree. An incredible cow with incredible genetics.